The small Winco WWB-6 Woven Wood Round Salad Bowl 6" is the perfect size for serving side dishes and salads directly to your customers. 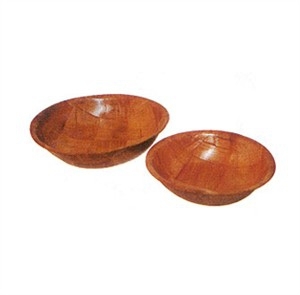 These sturdy wooden bowls are durable and long-lasting, crafted with a protective finish that protects the bowl while enhancing its natural beauty. Break-resistant, non-absorbent and dishwasher safe, small wooden salad bowls will make salads look healthier and your vegetables look more appealing.